A special look inside the Pathogen Reduction Box. The cover is always closed under normal use and will turn off immediately if the cover is opened. See video below for full demo. Patented Far-UV Sterilray is 10 to 1,000 times more effective than UV-C.
An automatic cut-off timer makes the PRB operation very simple to use. 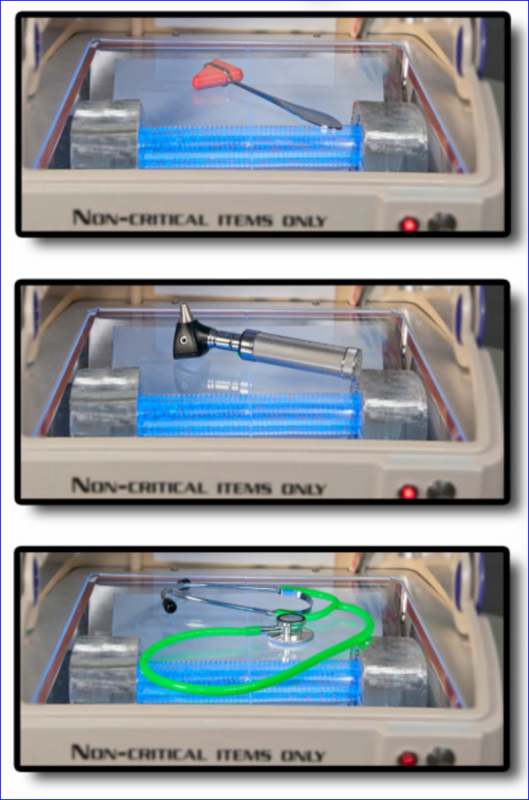 The Pathogen Reduction Box uses two lamps over and under an object placed inside on the special plate. 99.999% (log 5) reduction of MRSA, VRE was achieved in tests in just 20 seconds. Automatic cut-off if the door is opened. Dry treatment in 20 seconds automatically – Green Clean. Quick, high-level disinfection of objects with minimum effort. Comfort in knowing that pathogen removal has occurred in a convenient process. Reduction of germ levels and the chance of spreading to others. Increased confidence that germs are being reduced proactively. Thoroughly disinfects non-critical and personal items frequently passed from person to person. Used to quickly disinfect items prior to use in critical care situations. Used to quickly disinfect items prior to use in critical care situations. Examples include TV remotes, call buttons, charts, pens, oximeter probes, stethoscopes, blood pressure cuffs, and cell phones. Use to disinfect contaminated items prior to storage. Disinfect items such as clipboards, whistles, and pens prior to returning to the office. Ideal for tape, scissors, cell phones, and other items passed frequently during events. 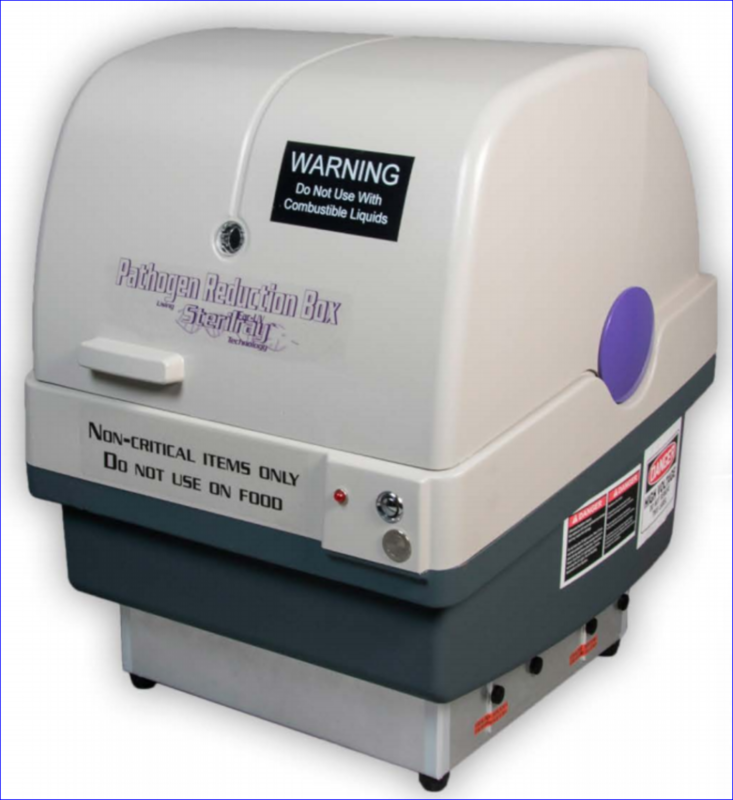 The Pathogen Reduction Box (PRB) using Far-UV Sterilray technology was tested in a clinical setting for its effectiveness against MRSA, VRE, and C. difficile spores. 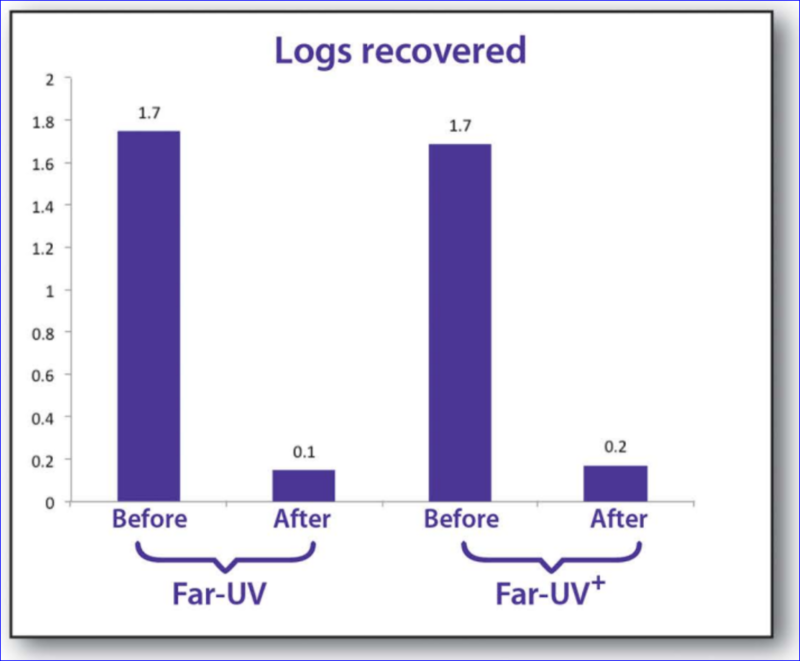 The largest reduction in the smallest amount of time was Clean HA MRSA at 5 seconds of FAR-UV+ exposure with kills of 4 log. Complete HA MRSA eradication was accomplished in the trials. The same activity occurred against multiple strains of MRSA, to be specific, the community-associated 300 stain type and ATCC strain 43300. • 20 Remote controls on the ward were disinfected using the PRB for 60 seconds without adjusting the positioning of the remote control in the PRB. • 20 Remote controls were sampled for MRSA, VRE, C.diff, and total bacteria before and after PRB treatment. The data shows a 10 fold reduction of bacteria in patient rooms on remote control surfaces. This correlates to a greater than 1.5 log reduction or a 98% reduction in aerobic bacteria; limited only by the amount of bacteria on the controls. Lab studies show that the PRB is capable of reducing 4 logs of MRSA or more.